"King Sweyn" redirects here. For other monarchs by that name, see Sweyn. "Sweyn of Norway" redirects here. For his grandson, see Svein Knutsson. For his regent ruler in Norway, see Sveinn Hákonarson. 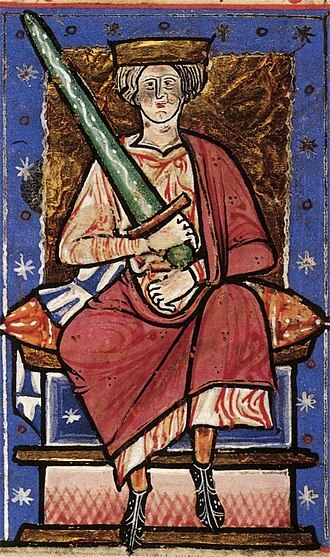 Sweyn Forkbeard (/sweɪn/; Old Norse: Sveinn Haraldsson tjúguskegg; Danish: Svend Tveskæg; 960 – 3 February 1014) was king of Denmark from 986 to 1014. He was the father of King Harald II of Denmark, King Cnut the Great and Queen Estrid Svendsdatter. In the mid-980s, Sweyn revolted against his father, Harald Bluetooth, and seized the throne. Harald was driven into exile and died shortly afterwards in November 986 or 987. In 1000, with the allegiance of Trondejarl, Eric of Lade, Sweyn ruled most of Norway. In 1013, shortly before his death, he became the first Danish king of England after a long effort. 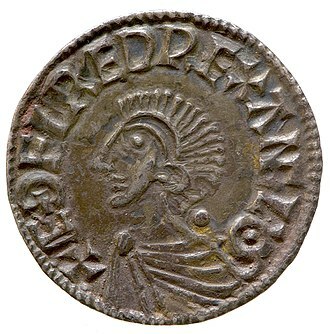 A coin of Sweyn Forkbeard, minted in 995; this is the earliest known coin with a Latin inscription minted in Scandinavia, based on Anglo-Saxon models and made by an English moneyer (obv. : ZVEN REX AD DENER "Sven, king of [or among] the Danes", rev. : GOD-WINE M-AN D-NER "Godwine, moneyer among the Danes"). Historiographical sources on Sweyn's life include the Anglo-Saxon Chronicle (where his name is rendered as Swegen), Adam of Bremen's 12th-century Deeds of the Bishops of Hamburg, and Snorri Sturluson's 13th-century Heimskringla. Conflicting accounts of Sweyn's later life also appear in the Encomium Emmae Reginae, an 11th-century Latin encomium in honour of his son king Cnut's queen Emma of Normandy, along with Chronicon ex chronicis by Florence of Worcester, another 11th-century author. Sweyn's father, Harald Bluetooth, was the first of the reigning Scandinavian kings to be baptised, in the early or mid-960s. According to Adam of Bremen, Harald's son Sweyn was baptised "Otto" (in honour of German king Otto I). There are conflicting records as to the identity of his mother. Adam of Bremen identifies her as "Gunhild", but some modern day scholars give her name as Tove from Western Wendland. Sweyn married the widow of Erik, king of Sweden, named "Gunhild" in some sources, or identified as an unnamed sister of Boleslav, ruler of Poland. Sweyn and the Jomsvikings at the funeral ale of his father Harald Bluetooth. Painting by Lorenz Frølich, c. 1883–86, Frederiksborg Castle. In the mid-980s, Sweyn revolted against his father and seized the throne. Harald was driven into exile and died shortly afterwards in November 986 or 987. Adam of Bremen depicted Sweyn as a rebellious pagan who persecuted Christians, betrayed his father and expelled German bishops from Scania and Zealand. According to Adam, Sweyn was sent into exile by his father's German friends and deposed in favour of king Eric the Victorious of Sweden, whom Adam wrote ruled Denmark until his death in 994 or 995. 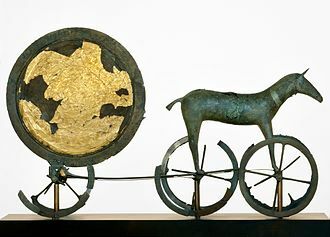 Sørensen (2001) argues that Adam's depiction of Sweyn may be overly negative, as seen through an "unsympathetic and intolerant eye". Adam's account is thus not seen as entirely reliable; the claimed 14-years' exile of Sweyn to Scotland does not seem to agree with Sweyn's building churches in Denmark throughout the same period, including the churches in Lund and Roskilde. According to Adam, Sweyn was punished by God for leading the uprising which led to king Harald's death, and had to spend fourteen years abroad (i.e. 986–1000). The historicity of this exile, or its duration, is uncertain. Adam purports that Sweyn was shunned by all those with whom he sought refuge, but was finally allowed to live for a while in Scotland. Adam also suggests that Sweyn in his youth lived among heathens, and only achieved success as a ruler after accepting Christianity. Division of Norway after the Battle of Svolder according to Heimskringla: The red area was under direct Danish control, with Sweyn's ruling it as a Danish extension. Eiríkr Hákonarson ruled the purple area as a fiefdom from Sweyn Forkbeard. The yellow area was under Sveinn Hákonarson, his half-brother, held as a fief of Olof Skötkonung, the Swedish king. Harald Bluetooth had already established a foothold in Norway, controlling Viken in c. 970. He may, however, have lost control over his Norwegian claims following his defeat against a German army in 974. Sweyn built an alliance with Swedish king Olof Skötkonung and Eirik Hákonarson, Jarl of Lade, against Norwegian king Olaf Tryggvason. The Kings' sagas ascribe the causes of the alliance to Olaf Tryggvason's ill-fated marriage proposal to Sigrid the Haughty and his problematic marriage to Thyri, sister of Svein Forkbeard. The allies attacked and defeated king Olaf in the western Baltic Sea when he was sailing home from an expedition, in the Battle of Svolder, fought in September of either 999 or 1000. The victors divided Norway among them. According to the account of the Heimskringla, Sweyn re-gained direct control of Viken district. King Olaf of Sweden received four districts in Trondheim as well as Møre, Romsdal and Rånrike (the Fagrskinna, by contrast, says that the Swedish part consisted of Oppland and a part of Trondheim). He gave these to his son in law, Jarl Svein Hákonarson, to hold as a vassal. The rest of Norway was ruled by Eirik Hákonarson as King Svein's vassal. The Jarls Eirik and Svein proved strong, competent rulers, and their reign was prosperous. Most sources say that they adopted Christianity but allowed the people religious freedom, leading to a backlash against Christianity which undid much of Olaf Tryggvason's missionary work. King Sweyn enlisted priests and bishops from England rather than from the Archbishopric of Bremen. This may have been a reason for Adam of Bremen's apparent hostility in his accounts. Numerous converted priests of Danish origin from the Danelaw lived in England, while Sweyn had few connections to Germany or its priests. 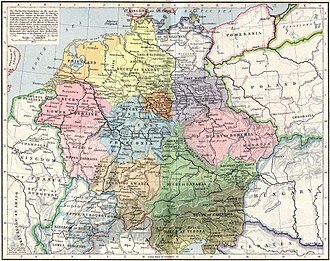 By allowing English ecclesiastical influence in his kingdom, he was spurning the Hamburg-Bremen archbishop. Since German bishops were an integral part of the secular state, Sweyn's preference for the English church may have been a political move. He sought to pre-empt any threat against his independence posed by the German kings. The "Chronicle of John of Wallingford" (c. 1225–1250) records Sweyn's involvement in raids against England during 1002–1005, 1006–1007, and 1009–1012 to avenge the St. Brice's Day massacre of England's Danish inhabitants in November 1002. According to Ashley (1998), Sweyn's invasion was partly motivated by the massacre of Danes in England ordered by Æthelred the Unready in 1002, in which his sister and brother-in-law are said to have been killed. but Lund (2001) argues that the main motivation for the raids was more likely the prospect of revenue. Sweyn campaigned in Wessex and East Anglia in 1003–1004, but a famine forced him to return to Denmark in 1005. Further raids took place in 1006–1007, and in 1009–1012 Thorkell the Tall led a Viking invasion into England. 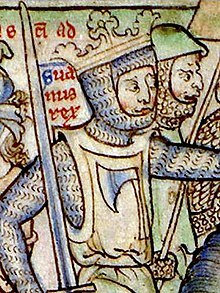 Simon Keynes regards it as uncertain whether Sweyn supported these invasions, but "whatever the case, he was quick to exploit the disruption caused by the activities of Thorkell's army". Sweyn acquired massive sums of Danegeld through the raids. In 1013, he is reported to have personally led his forces in a full-scale invasion of England. before the month of August came king Sweyn with his fleet to Sandwich. He went very quickly about East Anglia into the Humber's mouth, and so upward along the Trent till he came to Gainsborough. Earl Uchtred and all Northumbria quickly bowed to him, as did all the people of the Kingdom of Lindsey, then the people of the Five Boroughs. He was given hostages from each shire. When he understood that all the people had submitted to him, he bade that his force should be provisioned and horsed; he went south with the main part of the invasion force, while some of the invasion force, as well as the hostages, were with his son Cnut. 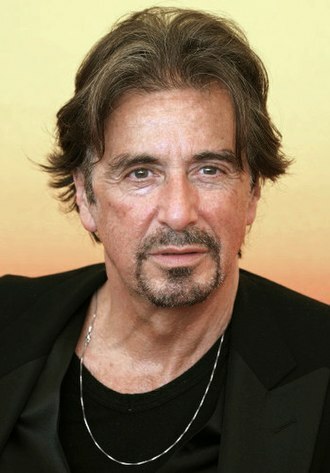 After he came over Watling Street, they went to Oxford, and the town-dwellers soon bowed to him, and gave hostages. From there they went to Winchester, and the people did the same, then eastward to London. But the Londoners put up a strong resistance, because King Æthelred and Thorkell the Tall, a Viking leader who had defected to Æthelred, personally held their ground against him in London itself. Sweyn then went west to Bath, where the western thanes submitted to him and gave hostages. The Londoners then followed suit, fearing Sweyn's revenge if they resisted any longer. King Æthelred sent his sons Edward and Alfred to Normandy, and himself retreated to the Isle of Wight, and then followed them into exile. On Christmas Day 1013 Sweyn was declared King of England. Based in Gainsborough, Lincolnshire, Sweyn began to organise his vast new kingdom, but he died there on 3 February 1014, having ruled England for only five weeks. His embalmed body was returned to Denmark for burial in the church he had built. Tradition locates this church in Roskilde, but it is more plausible that it was actually located in Lund in Scania (now part of Sweden). Sweyn's elder son, Harald II, succeeded him as King of Denmark, while his younger son, Cnut, was proclaimed King of England by the people of the Danelaw. However, the English nobility sent for Æthelred, who upon his return from exile in Normandy in the spring of 1014 managed to drive Cnut out of England. Cnut soon returned and became king of all England in 1016, following the deaths of Æthelred and his son Edmund Ironside; he succeeded his brother as King of Denmark in 1019 and eventually also ruled Norway, parts of Sweden, Pomerania, and Schleswig. 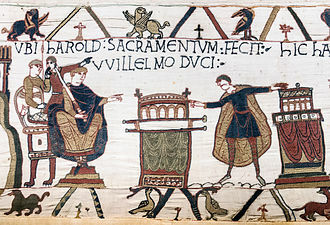 Cnut and his sons, Harold Harefoot and Harthacnut, ruled England over a combined 26-year period (1016–1042). 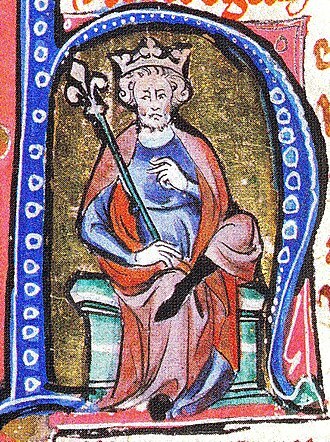 After Harthacnut's death, the English throne reverted to the House of Wessex under Æthelred's younger son Edward the Confessor (reigned 1042–1066). Sweyn's daughter, Estrid Svendsdatter, was the mother of King Sweyn II of Denmark. Her descendants continue to reign in Denmark to this day. One of them, Margaret of Denmark, married James III of Scotland in 1469, introducing Sweyn's bloodline into the Scottish royal house. After James VI of Scotland inherited the English throne in 1603, Sweyn's descendants became monarchs of England again. ^ Svæinn Harallz sunr; Latinized forms of the name Sveinn are Suanus, Suenus, or Sveinus (Haraldi filius). The nickname tjúguskegg is a compound of tjúga "fork" and skegg "beard". Sweyn is so named in Fagrskinna chapters 27 and 41 (ed. Finnur Jónsson 1902–8, pp. 161, 206), in both cases in references to Astriðr dottor Svæins tiuguskægs. ^ The Anglo-Saxon Chronicle. Manuscripts C, D, and E. Edited by Jebson, Tony. Accessed 18 August 2011. ^ Howard, Ian (2003). Swein Forkbeard's Invasions and the Danish Conquest of England, 991– 1017. Woodbridge: Boydell Press. pp. 7–8. ISBN 0-85115-928-1. ^ a b "Svend 1. Tveskæg". Den Store Danske. Retrieved 27 February 2013. ^ a b Lund, Niels (2001). "The Danish Empire and the End of the Viking Age", The Oxford Illustrated History of the Vikings. Ed. P. H. Sawyer. Oxford University Press, 2001, p. 167–181. ISBN 0-19-285434-8. ^ This is according to Heimskringla and Fagrskinna, see Lee M. Hollander (trans.) (1991) Heimskringla, p. 244 and Finlay Finlay, Alison (editor and translator) (2004) Fagrskinna, p. 130. According to Historia Norwegie and Ágrip, the Jarls actively worked to uproot Christianity in Norway, see Driscoll, M.J. (editor) (1995). Ágrip af Nóregskonungasǫgum. Viking Society for Northern Research, p. 35 and Ekrem, Inger (editor), Lars Boje Mortensen (editor) and Peter Fisher (translator) (2003). Historia Norwegie (2003), p. 101. ^ Lund, Niels (1986). "The armies of Swein Forkbeard and Cnut: leding or li(th)" Anglo-Saxon England 15 (1986), p. 39–40The Christianization of Scandinavia, Birgit Sawyer, et al., ed. Kungälv: Viktoria Bokforlag, p. 80. ISBN 91-86708-04-X. ^ Mike Ashley, British Monarchs; A complete genealogy, gazetteer and biographical Encyclopaedia of the Kings and Queens of Britain, Robinson Publishing (1998) p.483: "Probably his [Æthelred's] worst decision was the St. Brice's day massacre on 13 November 1002...he ordered the killing of every Dane who lived in England, except the Anglo-Danes in the Danelaw. The massacre brought back to English shores the Danish commander Swein, whose sister and brother-in-law had been killed in the massacre". ^ Blair, Peter Hunter (2003). An Introduction to Anglo-Saxon England (3rd ed.). Cambridge University Press. p. 98. ISBN 0-521-53777-0. ^ a b The Anglo-Saxon Chronicle. Everyman Press: London, 1912. Translation by James Ingram (London, 1823) and J. A. Giles (London, 1847). Medieval and Classical Literature Library Release #17. Retrieved 12 October 2006. ^ "Sweyn Forkbeard". Medieval Histories. 4 February 2014. Retrieved 9 March 2017. Wikimedia Commons has media related to Sweyn Forkbeard. Olaf II Haraldsson, known as St. Olaf, was King of Norway from 1015 to 1028. He was posthumously given the title Rex Perpetuus Norvegiae and canonised in Nidaros by Bishop Grimkell and his remains were enshrined in Nidaros Cathedral, built over his burial site. He is a saint of the Eastern Orthodox Church. The exact position of Saint Olafs grave in Nidaros has been unknown since 1568, Saint Olaf is symbolised by the axe in Norways coat of arms, and the Olsok is still his day of celebration. Many Christian institutions with Scandinavian links and Norways Order of St. Olav, are named after him, modern historians generally agree that Olaf was inclined to violence and brutality, and they accuse earlier scholars of neglecting this side of Olafs character. Especially during the period of Romantic Nationalism, Olaf was a symbol of independence and pride. Olaf IIs Old Norse name is Ólafr Haraldsson, during his lifetime he was known as Olaf the fat or the stout or simply as Olaf the big. In Norway today, he is referred to as Olav den hellige or Heilage-Olav in honour of his sainthood. Olaf Haraldsson had the given name Óláfr in Old Norse, Olav is the modern equivalent in Norwegian, formerly often spelt Olaf. His name in Icelandic is Ólafur, in Faroese Ólavur, in Danish Oluf, Olave was the traditional spelling in England, preserved in the name of medieval churches dedicated to him. Other names, such as Oláfr hinn helgi, Olavus rex and he is sometimes referred to as Rex Perpetuus Norvegiae, a designation which goes back to the thirteenth century. The term Ola Nordmann as epithet of the archetypal Norwegian may originate in this tradition and his mother was Åsta Gudbrandsdatter, and his father was Harald Grenske, great-great-grandchild of Harald Fairhair, the first king of Norway. Harald Grenske died when Åsta Gudbrandsdatter was pregnant with Olaf and she married Sigurd Syr, with whom she had other children including Harald Hardrada, who would reign as a future king of Norway. There are many texts giving information concerning Olaf Haraldsson, the oldest source that we have is the Glælognskviða or Sea-Calm Poem, composed by Þórarinn loftunga, an Icelander. The Jomsvikings were a semi-legendary order of Viking mercenaries or brigands of the 10th century and 11th century. They were staunchly Pagan and dedicated to the worship of deities as Odin. They reputedly would fight for any lord able to pay their substantial fees, although they were Pagan, the institutions of the Jomsvikings in some ways anticipated those of the Christian Knightly Orders of the Middle Ages. The legend of the Jomsvikings appears in some of the Icelandic sagas from the 12th and 13th centuries, according to the Norse sagas, their stronghold Jomsborg was located on the southern shore of the Baltic Sea, but the exact location is disputed by modern historians and archeologists. Most scholars locate it on the hill Silberberg, north of the town of Wolin on Wolin island in modern day Poland. Jomsborg is thought by researchers to be identical with Jumne and Vineta. Historians still debate the accuracy of the accounts of the Jomsvikings, since the site of their headquarters has never been conclusively located, confirming the tales of their exploits is somewhat difficult. The location of Jomsborg is a matter of debate in historical circles, there are no contemporary sources mentioning the names Jomsvikings and Jomsborg, but there are three contemporary runestones. Reference appears in Old Norse poetry and Lausavísur which refer to their battles, the Saga of the Jomsvikings relates that the Jomsvikings were highly selective in deciding whom to admit to their order. Membership was restricted to men of proven valor between 18 and 50, in order to gain admission, prospective members were required to prove themselves with a feat of strength, often taking the form of a ritual duel, or holmgang, with a Jomsviking. Once admitted, the Jomsvikings required adherence to a code of conduct in order to instill a sense of military discipline among its members. Any violation of these rules could be punished with expulsion from the order. Each Jomsviking was bound to defend his brothers, as well as to avenge their deaths if necessary and he was forbidden to speak ill of his fellows or to quarrel with them. Scania, known by its local name Skåne, is the southernmost province of Sweden which consists of a peninsula on the southern tip of the Scandinavian Peninsula and some islands close to it. Scania is roughly equivalent to the modern Skåne County, the responsibility for overseeing implementation of state policy in the county is administered by the County Administrative Board. Within Scania there are 33 municipalities that are independent and separate from the Scania Regional Council which has its seat in Kristianstad, the largest city is Malmö, which is the third largest city in Sweden. To the north, Scania borders the provinces of Halland and Småland, to the northeast Blekinge, to the east and south the Baltic Sea and Bornholm island, since 2000 a road and railway bridge, the Øresund Bridge, bridges the sound to the Danish island of Zealand. The HH Ferry route across the part of Øresund remains as an important link between the Scandinavian Peninsula and Zealand. Scania is part of the transnational Øresund Region, Scania was part of the kingdom of Denmark up until the Treaty of Roskilde in 1658. The transition to Sweden was confirmed by the 1660 Treaty of Copenhagen, the 1679 Peace of Lund, the last serious Danish attempt to invade the province failed in 1710, after the Battle of Helsingborg. The period 1658–1720 saw widespread violence by the Swedish militaries against the local population, the same was true about the Danish military, though to a far lesser extent. The region did not form part of Sweden proper until 1720 and it was divided in two counties and has since been regarded as fully integrated in Sweden. Until the early 19th century, a policy of forced assimilation was employed by the Swedish government in what had been a linguistically Danish region. Controversy relating to whether the Scanian dialects should be classified as a language or as Danish or Swedish dialects remains to this day. From north to south Scania is around 130 kilometres and covers less than 3% of Swedens total area, about 16% of Scanias population is foreign-born. With 120 inh/km2 Scania is the second most densely populated province of Sweden, the western part, along the coast of the Øresund, is by far the most populated part. Normandy is one of the regions of France, roughly corresponding to the historical Duchy of Normandy. Administratively, Normandy is divided into five departments, Eure, Orne and it covers 30,627 km², forming roughly 5% of the territory of France. Its population of 3.37 million accounts for around 5% of the population of France, Normans is the name given to the inhabitants of Normandy, and the region is the homeland of the Norman language. The historical region of Normandy comprised the region of Normandy, as well as small areas now part of the départements, or departments of Mayenne. For a century and a following the Norman conquest of England in 1066, Normandy and England were linked by Norman. Archaeological finds, such as paintings, prove that humans were present in the region in prehistoric times. Celts invaded Normandy in successive waves from the 4th to the 3rd century BC, when Julius Caesar invaded Gaul, there were nine different Celtic tribes living in Normandy. The Romanisation of Normandy was achieved by the methods, Roman roads. Classicists have knowledge of many Gallo-Roman villas in Normandy, in the late 3rd century, barbarian raids devastated Normandy. Coastal settlements were raided by Saxon pirates, Christianity began to enter the area during this period. In 406, Germanic tribes began invading from the east, while the Saxons subjugated the Norman coast, the Roman Emperor withdrew from most of Normandy. As early as 487, the area between the River Somme and the River Loire came under the control of the Frankish lord Clovis, the Vikings started to raid the Seine Valley during the middle of the 9th century. As early as 841, a Viking fleet appeared at the mouth of the Seine, after attacking and destroying monasteries, including one at Jumièges, they took advantage of the power vacuum created by the disintegration of Charlemagnes empire to take northern France. 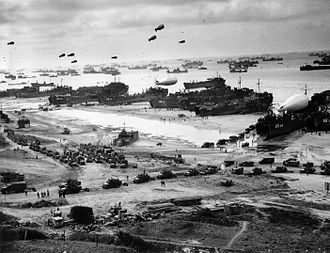 The fiefdom of Normandy was created for the Norwegian Viking leader Hrólfr Ragnvaldsson, Rollo had besieged Paris but in 911 entered vassalage to the king of the West Franks, Charles the Simple, through the Treaty of Saint-Clair-sur-Epte. Heimskringla is the best known of the Old Norse kings sagas. It was written in Old Norse in Iceland by the poet, the name Heimskringla was first used in the 17th century, derived from the first two words of one of the manuscripts. Snorri had himself visited Norway and Sweden, for events of the mid-12th century, Snorri explicitly names the now lost work Hryggjarstykki as his source. 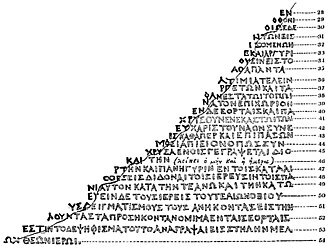 The composition of the sagas is Snorris, the earliest parchment copy of the work is referred to as Kringla. It voyaged from Iceland to Bergen and was moved to Copenhagen, at that time it had lost the first page, but the second starts Kringla heimsins, the Earths circle of the Laing translation. In the 17th century copies were made by Icelanders Jon Eggertson, eggertsons copy went to the Royal Library at Stockholm. The Copenhagen manuscript was among the many destroyed in the Copenhagen Fire of 1728. 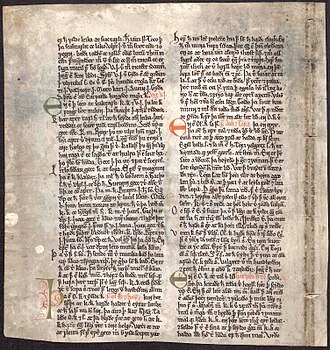 Only one leaf of the manuscript survived and it is now kept in the National, by the mid-16th century, the Old Norse language was unintelligible to Norwegian, Swedish or Danish readers. At that time several translations of extracts were made in Norway into the Danish language, the first complete translation was made around 1600 by Peder Claussøn Friis, and printed in 1633. This was based on a known as Jofraskinna. This edition included the first printing of the text in Old Norse, a new Danish translation with the text in Old Norse and a Latin translation came out in 1777-1783. An English translation by Samuel Laing was finally published in 1844, in the 19th century, as Norway was achieving independence after centuries of union with Denmark and Sweden, the stories of the independent Norwegian medieval kingdom won great popularity in Norway. Heimskringla, although written by an Icelander, became an important national symbol for Norway during the period of romantic nationalism, Heimskringla consists of several chapters, each one individually called a saga, which can be literally translated as tale. The subsequent sagas are devoted to individual rulers, starting with Halfdan the Black, the stories are told with a life and freshness, giving a picture of human life in all its reality. The Lund Cathedral is the Lutheran cathedral in Lund, Sweden. 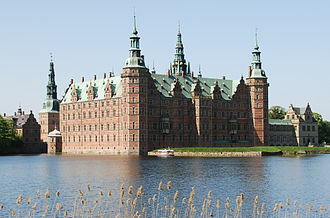 It is the seat of the bishop of Lund of the Church of Sweden, until the Danish Reformation, it was the Catholic episcopal see of the Diocese of Lund, dedicated to Saint Lawrence. Lund was an important town long before there was a cathedral, Lund was the site of the Skåne Assembly at St Libers Hill into the Middle Ages. It was the site of a religious center. A cathedral was built in Lund before 1085, but it is difficult to know if the present building was built in the same place. In the gift letter of Canute the Holy, dated to 21 May 1085, Canute gave several properties that enabled the building of the cathedral. However, sources indicate that Canutes cathedral is not the present Lund Cathedral, the Cathedral School was established in 1085, making it Scandinavias oldest school. Lund was named as the headquarters, bishop Asser Thorkilsson became the first archbishop for all of Scandinavia in 1104 and the cathedral was begun sometime after he took office. The building was constructed in the basilica style with half-rounded arches supporting a flat timber ceiling. The cathedral was constructed out of blocks of sandstone from a quarry near Höör, the high altar of the crypt was consecrated in 1123. The cathedral and the altar were consecrated to St Lawrence on 1 September 1145 by Archbishop Eskil. Of the present church only the apse has remained unchanged, Lund became the religious heart of Denmark and over the years many monasteries, priories sprang up around the cathedral. Lund played a role in Denmarks history from the time it was made a bishopric. It was the place of many important meeting between kings and nobility, valdemar II was crowned there in 1202. In 1234 the church suffered an extensive fire, when the church was rebuilt a lecture wall, new vaults and a new facade to the west were added. Many valuable artistic additions were done to the church in mediaeval times, in 1294 Archbishop Jens Grand was arrested in the Cathedral. In the 1370s, magnificent gothic choir stalls where installed in the church, an astronomical clock was installed in the nave around 1424 and renovated many times. Gainsborough is a town in the West Lindsey district of Lincolnshire, England. The population of the town was 18,508 at the 2011 census and it is situated 18 miles north-west from the city and county town of Lincoln, and on the River Trent. At one time it served as an important port with trade downstream to Hull, Gainsborough was one of the capital cities of Mercia during the Anglo-Saxon period, which had preceded Danish rule. It is understandable that the Viking kings would have drawn to it as an administrative centre. In 868 King Alfred married Ealswitha, daughter of Aethelred Mucill, chief of the Gaini, Gainsborough is the capital that never was. Towards the end of July 1013, the Dane Sweyn Forkbeard, together with his son Canute, Sweyn defeated the Anglo-Saxon opposition and King Ethelred fled the country. Sweyn was declared King of England, and he returned to Gainsborough and Canute took up high office at the Gainsborough Castle, while his army occupied the camp at Thonock. But King Sweyn was killed five weeks when he was thrown from his horse in Gainsborough and his son Canute established a base elsewhere. King Canute may have performed his attempt to turn the tide back in the River Trent at Gainsborough. Historians believe he may have been demonstrating on the aegir, a tidal bore and he and his supporters may have known Gainsborough was the furthest reach of the aegir, and ideal for his demonstration. However the story was written down a century by Henry of Huntingdon, who gives no location. The Domesday Book records that Gainsborough was exclusively a community of farmers and sokemen, the population was only about 80 people, of which about 70% were of Scandinavian descent. The Lindsey Survey of 1115-18 records that Gainsborough was held by Nele d’Aubigny and he was the forebear of the Mowbray family, and the Mowbray interest in Gainsborough continued until at least the end of the 14th Century. A weekly market was granted by King John in 1204, Thomas Burgh acquired the manor of Gainsborough in 1455. He built Gainsborough Old Hall between 1460 and 1480, a large, 15th-century, timber-framed medieval strong house, and one of the manor houses in Britain. Only known type of coin of Olaf Tryggvason, in four known specimens. Imitation of the Crux-type coin of Æthelred the Unready. Statue of Olaf in the city plaza of Trondheim. Between the king's legs lies the head of the slave Kark, Haakon jarl's murderer. Olaf in the temple of Thor (Illustration by Halfan Egedius). 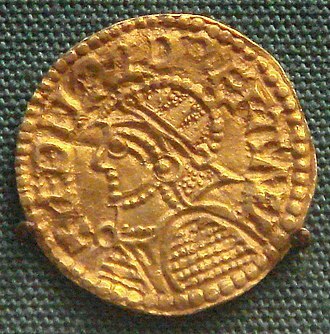 Coin of Olaf dated 1023–28. The cathedral seen from the Bispegården (Bishop's house). Christian IX's Chapel (right) and Frederick IX's Burial Site (left). Inner view of the Cathedral, from the entrance towards the high altar. Closer view of the absis and altar. Gothic altarpiece dating from 1398. The Sjörup Runestone is generally associated with the Jomsviking attack on Uppsala, the Battle of the Fýrisvellir. It says:Saxi placed this stone in memory of Ásbjörn Tófi's/Tóki's son, his partner. He did not flee at Uppsala, but slaughtered as long as he had a weapon. The deceased could be incinerated inside a stone ship. The picture shows two of the stone ships at Badelunda, near Västerås, Sweden. Sketch of the executioner during a pagan Norse sacrifice by Carl Larsson, for Midvinterblot. A drinking scene on an image stone from Gotland, Sweden, in the Swedish Museum of National Antiquities in Stockholm. Letter from Eric of Pomerania dated 1437, with a description of the arms granted to the city of Malmö. The motorway through western Scania, E6, here at motorway service Glumslöv, is the artery of the western part of the province. The Viking Age image stone Sövestad 1 from Skåne depicts a man carrying a cross. Haakon Jarl was given missionaries by the king of Denmark, but before departure, Haakon sent the missionaries back. In 1691 coin expert Elias Brenner published designs allegedly used by King Eric, but a minting of coins by Eric is unknown to modern scientists, and these attributions are considered inaccurate; Brenner's methods are not considered reliable on early medieval Swedish coins. Gerhard Munthe, Kringla Heimsins, illustration for Ynglinga Saga. Emma receiving the Encomium, in The Encomium Of Queen Emma, British Library MS 33241. The Ordeal of Queen Emma by William Blake. Beginning of Book 1 in the Vienna manuscript (Codex Vindobonensis 521, fol. 3r). First page of the descriptio insularum aquilonis in the Vienna manuscript (Codex Vindobonensis 521, fol. 69v). The Battle of Grathe Heath as envisioned by Lorenz Frølich. King Henry I's Dream in the Chronicle. 17th century depiction of Harald II. Olaf Tryggvason proposes marriage to Sigrid, imposing the condition that she must convert to Christianity. When Sigrid rejects this, Olaf strikes her with a glove. She warns him that this might lead to his death. Sønder Vissing Runestone, raised by Tove in memory of her mother. A facsimile of Adam of Bremen's magnum opus. Queen Emma of Normandy receiving the Encomium Emmae Reginae from the author (kneeling), with her sons Harthacnut and Edward the Confessor in the background. This illustration is found in the extant 11th-century copy of the Encomium in the British Library.